The Philips Series, 3000 7-in-1 Grooming Kit for Face and Beard MG3720/13, is an exceptional hair-cutting solution especially for those people who require several accessories. The shaving kit has a beard, ear and nose trimmer that enhances the product’s efficiency. This trimmer also boasts an elegant look that is sleek. The all-in-one Philips series 3000 trimmer is durable and has a self-sharpening feature as well as skin-friendly blades that ensure that the user gets the perfect trim. The shaver comes with up to seven tools. 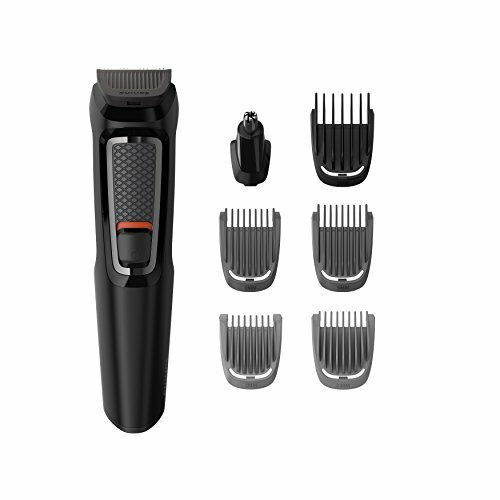 The shaver kit includes two stubble combs, one hair comb, and two beard combs. The parts of the shaver are easily detachable making the rinsing and cleaning of the blades and combs easy. The other exciting feature of the grooming gadget is its 60 minutes run-time of cordless use per charge. The Philips MG3720/13 for face and beard gives an all-in-one approach to the grooming of the face; from working on patches of scruff to the shaving of hairs within the noise and the ears. The shaving trimmer has a full-size shaver. This is useful whenever one needs to shave and trim huge chunks of hair on their face particularly hair on the head without the need of additional combs added on to the beard trimmer. Stubble and beard combs that clip on the shaver. These combs come in handy when one wants to trim their hairs only as they ensure that the user can control their shaving and trim. There are 5 of them which come in the following lengths: 1mm, 2mm, 3mm, 5mm, and 9mm. The shorter lengths are there for a stubble trim up to a hair length with the 9mm comb. For the tight orifices, the grooming accessory comes handy with a nose and ear trimmer that ensures that the hair in these tight spots is not assumed during facial hair cleaning and that they are effectively trimmed as well. It also has a detail trimmer for the sharp and tight curves whenever the person shaving may want tighter control. The 3000 series has a high-speed mode. This ensures that the person shaving gets an easy cutting through any tough or wiry hairs. As per the Philips in-house technologies and standards, the shaver razor does not need the user to keep oiling it, because of the self-sharpening blades which should be as sharp years later. The several attachments that the Philips 3000 series comes with make it an impressive choice for the creative facial hair shaving and trimming. 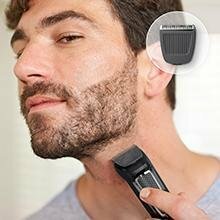 The grooming gadget makes it easy for a user who just wants use a basic shaver to cut and trim their facial hairs as the nose, and ear trimmer also conclude on any other trimming for the hairs in the particular areas. Other than the basic need like shaving the head hair and trimming hair on the nose and ear, the other attachments in the package enable the user to do much more. It has detail trimmers that enhance its abilities when it comes to working on fine angles and curves. The five combs also provide excellent options for eliminating any stray hairs as well as maintaining uniformity of the thick beards and thick hair on the head. The Philips Series, 3000 7-in-1 Grooming Kit for Face and Beard, has a body mainly made in a way that ensures that it stays productive and effective for the longest time possible. The shaver is built to last. The trimmer is built and engineered to provide the user with a reliable and effective performance for a long time. The trimming parts do not require time to time oiling. The self-sharpening blades enhance the trimming as one uses the shaver from time to time. The blades made of steel lightly brush against each other as they work thus sharpening themselves. This effect sees to it that the shaver maintains sharp blades throughout its usage over time. The shaving kit is small and fits so comfortably into small pockets of rucksacks and sports bag for those who would love to travel with the shaver. The material used mainly in the, making the shaver and the components, plastic, makes it very lights and thus only makes the portability of the grooming gadget easier. The 7-in-1 kit can easily be carried around in ones travel luggage. The durability of the battery only enhances the portability features of the beard trimmer. The battery can go for a long time without the user having to recharge the shaver again. Per charge, the shaver can run for 60 minutes of shaving after 16 hours of charging. The battery is also compatible with all the voltages around the world, and this means that irrespective of where the trip ends, one can always carry the grooming kit with them without the fear of never getting to recharge it. All factors considered, Philips Series MG3720/13 for face and beard is a dedicated shaver especially when it comes to precision. Its wide variety of combs and attachment makes the manscaping a lot easier irrespective of the particular task a user is engaging in. It comes in with a very good overall rating of 4.4 out of 5 stars with over 93% of the ratings at 4 stars or higher. We recommend this beard trimmer for you.